Hill's Science Diet Dry Dog Food Active Longevity Mature 12kg Hill's® Science Diet® Mature Adult Active Longevity™ Original dog food provides precisely balanced nutrition for a visible difference in your dog. It provides tested nutrition to restore youthful energy in 30 days* and contains clinically proven antioxidants to maintain overall health and a strong immune system. It is made with high quality ingredients which are easy to digest and contains Glucosamine and Chondr..
Hill's Science Diet Dry Dog Food Active Longevity Mature 3kg Hill's® Science Diet® Mature Adult Active Longevity™ Original dog food provides precisely balanced nutrition for a visible difference in your dog. It provides tested nutrition to restore youthful energy in 30 days* and contains clinically proven antioxidants to maintain overall health and a strong immune system. It is made with high quality ingredients which are easy to digest and contains Glucosamine and Chondro..
Hill's Science Diet Dry Dog Food Active Longevity Mature 7.5kg Hill's® Science Diet® Mature Adult Active Longevity™ Original dog food provides precisely balanced nutrition for a visible difference in your dog. It provides tested nutrition to restore youthful energy in 30 days* and contains clinically proven antioxidants to maintain overall health and a strong immune system. It is made with high quality ingredients which are easy to digest and contains Glucosamine and Chond..
Hill's Science Diet Dry Dog Food Adult Healthy Mobility 12kg All dogs, large and small, can experience from mobility issues at different stages of life. Hill's™ Science Diet™ Adult Healthy Mobility™ dog food has tested nutrition to enhance active mobility and to help improve joint flexibility in just 30 days! Enriched with high levels of Omega-3 fatty acids; plus Glucosamine and Chondroitin Sulfate from natural sources - Science Diet™ Adult Healthy Mobility™ dog food ..
Hill's Science Diet Dry Dog Food Adult Large Breed 12kg Key Benefits Benefit Nutrient How It Works Healthy immune function Vitamin C + E Optimal levels of clinically proven antioxidants for a healthy immune system. Ideal body composition Carnitine Converts..
Hill's Science Diet Dry Dog Food Adult Large Light 12kg Key Benefits Recommended For: Large breed dogs that are prone to gaining excess weight. It is suited for large breed dogs 1 -- 5 years of age with an ideal weight of 55 -- 110 lbs, and giant breeds 1 -- 4 years of age with an ideal weight of 110+. Not Recommended For: Puppies, adult dogs not prone to gaining excess weight. Pregnant or nursing dogs. During pregnancy or nursing, dogs shou..
Hill's Science Diet Dry Dog Food Adult Large Light 3kg Key Benefits Recommended For: Large breed dogs that are prone to gaining excess weight. It is suited for large breed dogs 1 -- 5 years of age with an ideal weight of 55 -- 110 lbs, and giant breeds 1 -- 4 years of age with an ideal weight of 110+. Not Recommended For: Puppies, adult dogs not prone to gaining excess weight. Pregnant or nursing dogs. During pregnancy or nursing, dogs shoul..
Hill's Science Diet Dry Dog Food Adult Light 12kg Key Benefits Recommended For: Adult dogs 1-6 years of age that require fewer calories (i.e. dogs that are less active, neutered or otherwise prone to weight gain). Not Recommended For: Puppies, adult dogs not prone to gaining excess weight. Pregnant or nursing dogs. During pregnancy or nursing, dogs should be switched to Science Diet® Puppy Healthy Development Original, Science Diet..
Hill's Science Diet Dry Dog Food Adult Oral Care 12kg Hill's® Science Diet® Adult Oral Care dog food provides precisely balanced nutrition with enhanced oral care benefits. It has interlocking fiber technology that helps scrub teeth and is clinically proven to reduce plaque build-up. It contains proprietary blend of antioxidants to enhance immune system and for overall health. High quality ingredients in this food are easy to digest and ensure nutrient absorption in the body. ..
Hill's Science Diet Dry Dog Food Adult Oral Care 2kg Hill's® Science Diet® Adult Oral Care dog food provides precisely balanced nutrition with enhanced oral care benefits. It has interlocking fiber technology that helps scrub teeth and is clinically proven to reduce plaque build-up. It contains proprietary blend of antioxidants to enhance immune system and for overall health. High quality ingredients in this food are easy to digest and ensure nutrient absorption in the body. ..
Hill's Science Diet Dry Dog Food Adult Sensitive Skin 12kg Key Benefits Recommended For: Adult dogs 1 -- 6 years of age with dry, flaky, itchy and sensitive skin. Not Recommended For: Puppies, pregnant or nursing dogs, or mature adult dogs. 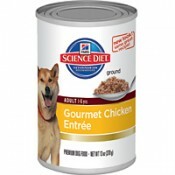 During pregnancy or nursing, dogs should be switched toScience Diet® Puppy Healthy Development Original, Science Diet® Puppy Small Bites or Science Diet® Puppy Lamb Meal & Rice Recipe. ..
Hill's Science Diet Dry Dog Food Adult Sensitive Skin 2kg Key Benefits Recommended For: Adult dogs 1 -- 6 years of age with dry, flaky, itchy and sensitive skin. Not Recommended For: Puppies, pregnant or nursing dogs, or mature adult dogs. During pregnancy or nursing, dogs should be switched toScience Diet® Puppy Healthy Development Original, Science Diet® Puppy Small Bites or Science Diet® Puppy Lamb Meal & Rice Recipe. ..
Hill's Science Diet Dry Dog Food Adult Sensitive Stomach 12kg Key Benefits Recommended For: Adult dogs 1 -- 6 years of age with sensitive stomachs (i.e. occasional loose stools, upset stomach, or trouble tolerating current food). Not Recommended For: Puppies, pregnant or nursing dogs, or mature adult dogs. During pregnancy or nursing, dogs should be switched toScience Diet® Puppy Healthy Development Original, Science Diet® Puppy Small Bites or Sci..
Hill's Science Diet Dry Dog Food Adult Sensitive Stomach 2kg Key Benefits Recommended For: Adult dogs 1 -- 6 years of age with sensitive stomachs (i.e. occasional loose stools, upset stomach, or trouble tolerating current food). Not Recommended For: Puppies, pregnant or nursing dogs, or mature adult dogs. During pregnancy or nursing, dogs should be switched toScience Diet® Puppy Healthy Development Original, Science Diet® Puppy Small Bites or Scie..
Hill's Science Diet Dry Dog Food Adult Small Bites 2kg Key Benefits Recommended For: Adult dogs 1 - 6 years of age. Not Recommended For: Puppies, pregnant or nursing dogs, or mature adult dogs. During pregnancy or nursing, dogs should be switched toScience Diet® Puppy Healthy Development Original, Science Diet® Puppy Small Bites, 'Science Diet® Puppy Lamb Meal & Rice Recipe, Science Diet® Nature's Best® Chicken & Brown Rice Dinner Puppy or ..
Hill's Science Diet Dry Dog Food Adult Small Bites 8kg Key Benefits Recommended For: Adult dogs 1 - 6 years of age. Not Recommended For: Puppies, pregnant or nursing dogs, or mature adult dogs. During pregnancy or nursing, dogs should be switched toScience Diet® Puppy Healthy Development Original, Science Diet® Puppy Small Bites, 'Science Diet® Puppy Lamb Meal & Rice Recipe, Science Diet® Nature's Best® Chicken & Brown Rice Dinner Puppy or ..
Hill's Science Diet Dry Dog Food Advanced Fitness 12kg Hill's® Science Diet® Adult Advanced Fitness Original dog food provides precisely balanced nutrition for a visible difference in your dog. It provides tested nutrition to improve skin & coat health within 30 days, and contains optimal levels of clinically proven antioxidants for a helathy immune system. It is made from high quality ingredients which are easy to digest ensuring optimal nutrient absorption to keep your do..
Hill's Science Diet Dry Dog Food Advanced Fitness 3kg Hill's® Science Diet® Adult Advanced Fitness Original dog food provides precisely balanced nutrition for a visible difference in your dog. It provides tested nutrition to improve skin & coat health within 30 days, and contains optimal levels of clinically proven antioxidants for a helathy immune system. It is made from high quality ingredients which are easy to digest ensuring optimal nutrient absorption to keep your dog..
Hill's Science Diet Dry Dog Food Advanced Fitness 7.5kg Hill's® Science Diet® Adult Advanced Fitness Original dog food provides precisely balanced nutrition for a visible difference in your dog. It provides tested nutrition to improve skin & coat health within 30 days, and contains optimal levels of clinically proven antioxidants for a helathy immune system. It is made from high quality ingredients which are easy to digest ensuring optimal nutrient absorption to keep your d..
Hill's Science Diet Dry Dog Food Healthy Mobility Large Breed 12kg Large Breed dogs can experience mobility issues at different stages of life. New Hill's™ Science Diet™ Adult Healthy Mobility™ dog food has tested nutrition to enhance active mobility and helps improve joint flexibility in just 30 days! Enriched with high levels of Omega-3 fatty acids; plus Glucosamine and Chondroitin Sulfate from natural sources - Science Diet™ Adult Healthy Mobility™ dog food helps maintain ea..